Brandy is a spirit derived from distilling wine. It was introduced to the Dutch in the 17th century and given the name "Bradewijin" which means burnt wine, due to the fact the wine used to be boiled. 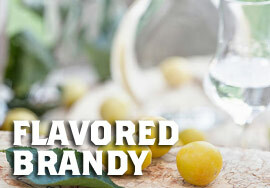 Flavored brandy is made from grapes and then infused with different flavors or fruits, which make them a great base to make any number of delicious cocktails.